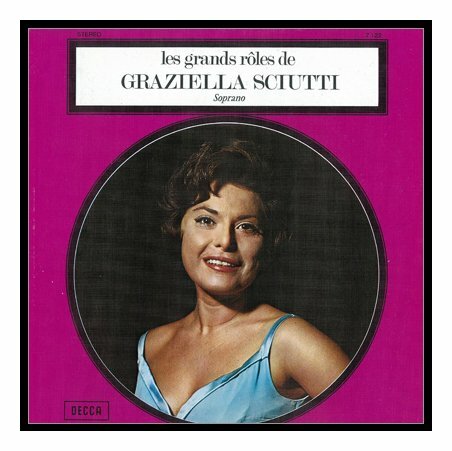 Graziella Sciutti Interview with Bruce Duffie . . . . . . . This webpage, however, is devoted to my interview with Sciutti. Long a favorite in many roles, she was moving into the realm of directing and teaching. More details of her distinguished career can be found in the obituary at the bottom of this page. Petite in stature and disarmingly coquettish in nature, our conversation was spiced with much laughter thoughout. Sciutti always displayed a wide-eyed enthusiasm when speaking about the topics, and gave thoughtful answers to each question posed. We met at her hotel, and utilized a table downstairs in the unoccupied bar-area near a circular staircase. As we settled into the nearly-deserted restaurant, we noted the pleasant surroundings and then got down to business . . . . .
Graziella Sciutti: Now what do you want to know? Bruce Duffie: [With great eagerness] Oh first, tell me the secret of singing Mozart! GS: [Laughs] There is no secret! GS: Yes, well, that’s what they say... The critics, the public, the theater directors and the conductors have been so kind to give me the title. I confess that when I started singing I didn’t think to become what one would say a Mozart singer in particular. I was singing, of course, quite a few things of Mozart, but I must say that the beginning of my career was not dedicated to opera. I studied in a conservatory and got my music degree with, of course, all the operatic repertoire, but my wish was to be a concert singer. This was probably influenced by my family background. My father was a musician — an organist and a pianist — and the music that I heard at home and what I was taken to was more the concert than the operatic repertoire. BD: This was in Turin? GS: No. I was born in Turin but I was brought up in Rome. Actually, my early childhood was in Geneva, and then for school we lived in Rome, where I did all my studies [at the St. Cecilia Academy]. Of course there is quite a choice there of performances, especially concerts. So my real wish when the music appeared to me was to make that my profession. I was dedicated to that. It was after only one year that I had an immediate success on the concert stage. I made my début in the St. Matthew Passion of Bach conducted by von Karajan, which was an occasion! I had to substitute for a singer who was taken ill at the last moment, and in Rome there was absolutely nobody who could sing Bach but a very young student of the conservatory! [Both laugh] Then immediately I had all these other oratorios with Hermann Scherchen and Victorio Gui, all very high standard concerts. After one year of all that, I was invited by the director of the festival at Aix-en-Provence, in the South of France, which had just started a few years previous, to perform in opera, which surprised me very much. I was uncertain of the result of such an enterprise. BD: Uncertain of the dramatics? BD: Were you unsure of your voice? GS: No, I was not unsure of the voice because when I took my degree at the conservatorium, I had to sing opera too. It’s just that I was not tempted by the theatrical. I must say at that time I was a bit put off by the fact that the few operas I had seen really didn’t appeal to me. Singers didn’t used to play on stage; they just threw sounds around, and that was not enough for me. I felt that there was then something more to it. When I made my début then I accepted it because the gentleman insisted. I was extremely young and probably he was attracted by a funny, petite young singer that could perform. The first role I performed on the stage was Lucy in The Telephone of Menotti. [See my Interviews with Gian Carlo Menotti.] It was in French, and then the same evening Matrimonio Segreto of Cimorosa. That started, somehow, this bug of opera! Then I was lucky enough then to meet a great theatrical man in Paris, Sacha Guitry, who offered me a role in one of his plays in Paris, with some music of Reynaldo Hahn. Here started probably everything because I was to perform Mozart himself as a young man of eighteen during his second journey to Paris. It was a little story of around this occasion. I was invited to do that in Paris in French because I speak French. My mother was French, and I was brought up bilingual in French and Italian. So it was not a difficulty for me, although it was a difficulty to perform it on the stage. It’s quite different to speak at home than when you go onstage in the theater! So with that came very much the interest to join theater and music, and I understood that one could do something more in the opera than just stand there and sing. But then there were years were opera took on sort of a new face. That was not the only time; all the generations have liked more these types of innovations. All this gave me a background to understand more certain types of opera, some more than another, and for my vocal attitude which is also for interpretation. Of course all my work was in the Mozart repertoire, which was more apt to what I wanted to give to the theatrical music. My background of singing Handel, Haydn, Bach made my encounter with Mozart very easy. BD: Were you pleased with these characters then? Your voice forced you into certain roles. GS: Yes. Of course, when I started my career I did also other repertoire. I didn’t only sing Mozart. I’ve done a lot of Rossini and Donizetti. BD: But you had no latent desires to sing Norma or Brünnhilde? GS: [Laughs] That wouldn’t have been for my timbre of voice. The choice you have goes to a certain type of sound and voice, and that was very clear. My voice and my personality, luckily enough, have what we in French say, Le physique du role! My body was right for these roles! BD: Sure! You look very, very slim and very petite. GS: I am petite, and so I managed very well in this. Altogether this is a blessing, because I have seen and I had some colleagues with also such light voices, very brilliant but huge ladies. So what can you do? BD: [Trying to suggest something positive for them] They could sing on the radio where you don’t see singers! GS: Ah, yes, but today you don’t make a career on the radio. Some of them have to force their voice into another repertoire which has then enabled them to sing a shorter career than what they could have done if they could have managed the right repertoire with their true voices. The voice is what it is, and if you use it badly, it just goes away. BD: Are voices better today than they were thirty years ago? GS: No! I wouldn’t say so. Every time has its bunch of people with good voices. Today, I would say there is more possibility of training, and more schools than probably there would have been before. There is also the mass media. You can hear much more on radio, television and records and cassettes, everything. This was true even in my time because it’s not so long ago [laughs], but it is expanding. We didn’t have all that before. We couldn’t record a rehearsal ourselves, or make a cassette and then hear it like I do now. In the last ten years of my performances I worked with that. I record the performances and could listen to them and work on it. I record now my recitals, and it’s very interesting to have that. But there is one snag today because there are fewer rehearsals in the theater. We worked much, much harder to prepare an opera. 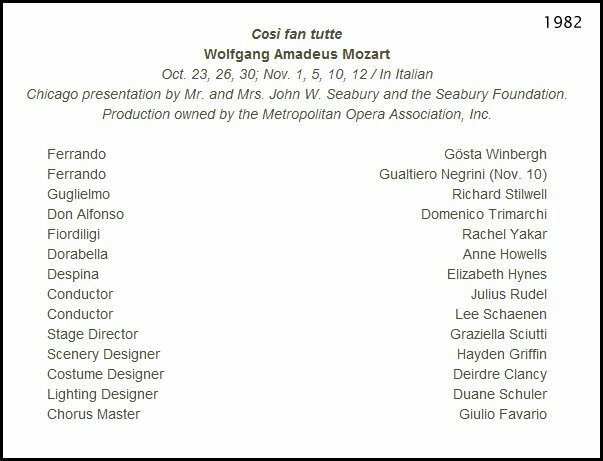 I’ve lived with one very exceptional production, and that was the Così fan Tutte at La Piccola Scala. This was the only opera conducted by Guido Cantelli, who unfortunately died a few months later. For that occasion we had thirty orchestra rehearsals. BD: [With genuine amazement] Thirty orchestra rehearsals??? GS: Yes. That was quite exceptional even for that time. It was for January 1956, because it was the 200 year anniversary of Mozart’s birth, so it’s a very easy date to remember. There is even a recording of it now. It has come out of that broadcast, with all the defects that such a recording can have. It was a live performance so there is all the movement, etc. But still, it’s a historical recording, and you feel the unity of music and theater, the musical expression even without seeing the people. BD: So you are pleased that the recording was made and is now available? GS: Very much so, though we are sometimes a bit mad at such things because not all of them are of this standard. We don’t like that less-good performances are on record, and there are some people that do take advantage of us because we don’t get anything out of it. GS: It’s not as if one has to be mercenary, but as long as some other people do make money out of us, it wouldn’t be bad that a little percentage would come also to us. We are really the ones who are on the record! [Both laugh] But it is very pleasant, nevertheless, to have a testimony of some important evening still there. BD: Now also made some studio recordings of course? BD: Are those better than the live recordings? GS: Technically most definitely. There are some of them that are really artistically wonderful. There is a Don Giovanni, for example, on EMI conducted by Giulini, with Sutherland as Donna Anna, Schwarzkopf as Elvira, Eberhart Wächter as Don Giovanni, Taddei as Leporello and Alva as Ottavio. [See my Interview with Joan Sutherland.] 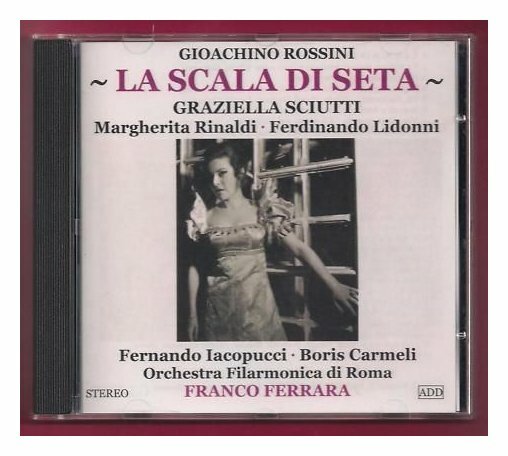 This is a very outstanding ensemble, and the recording itself technically is superb. Although it is at least twenty years ago, it’s still sells and it’s been reprinted. It is really something quite outstanding. BD: It is a wonderful recording. GS: It is, although I love enormously one that has come out of a live performance of Salzburg Festival from about that same time conducted by von Karajan. Donna Anna is Leontyne Price, Schwarzkopf again is Elvira and Wächter is Don Giovanni. It is a completely different interpretation from Giulini, and of course the defects of a live performance are there. You hear the footsteps, and voices suddenly appear from another side. It’s not always so pleasant, but there is such a vitality in the performance. BD: Some live performances that we’ve heard seem to a better vitality than something that is cut and pasted in the studio. BD: Is that a fraud? GS: It can be a fraud because you know very well that the artists and that orchestra or that conductor will never get a complete live performance the way he gets it on that recording. BD: Are performers today in competition with these recordings that are out in the marketplace? GS: No. Recording is never a competition with a live performance. BD: The public doesn’t expect this kind of perfection in the theater? GS: No, I don’t think so. Yes, there are certainly some people who do expect that, and they go home disappointed. It’s too bad for them! But there is a majority who come to the theater to live an experience that is never to be repeated. It is quite different, and that is why what you feel in the live recording is that the artist himself knows that there’s no going back. The perfection has to come at the first go, and the attention and the tension that he puts in that performance is different than the attention that he puts in a recording. BD: I would think that the concentration is very different because you are doing just a section in the studio, but the performance has the sweep of the whole opera as conceived by the composer and librettist. BD: You have sung Mozart and Bellini and Donizetti. Have you also done older music? GS: Yes, some Monteverdi. I started with very old Italian music. BD: Do the works of Monteverdi and Cavalli speak to us today in 1982? GS: Yes! Very much so. As a matter of fact, it was part of my conversion in studying music and singing. After doing some vocalizing, I must confess I was not one of those who wanted to be an opera singer, or a singer at all. I was very interested in music because of my family. I played the piano because of my father. He got me to study piano, but at the same time I did some painting and some dancing. Music was not the passion, let’s say. It came soon enough, but only with working on the music I found my way of expressing myself. One of the things that really made me understand that was when I took some classes for interpretation of Monteverdi opera and Monteverdi in general, and what is called the Camerata Fiorentina which included Caccini, Jacopo Peri, Strozzi and others. Then I realized that all the world started to come alive for me. I’ve done also some contemporary music including Stravinsky, as a matter of fact. I’ve done his Rake’s Progress and Les Noces, which was conducted by him. BD: How is he as a conductor? GS: Well... he was alright! The concert was prepared by his assistant, but it was an extraordinary personality of course that he came. BD: I just wonder if the composer is too close to his own work, and that it should be conducted by someone else? GS: I don’t know. I was very excited to be able to sing with him, so everything was a bit of dream! I’ve seen better conductors, though. [Both laugh] I’m glad that it was Leinsdorf that conducted my Rake’s Progress where I sang my Anne Truelove. [See my Interviews with Erich Leinsdorf.] I’ve also done more modern Italians like Goffredo Petrassi and Dallapiccola and a lot of Pizzetti. BD: He seems to be more of a melodist. GS: Yes. Pizzetti came very much back to inspiration from the Gregorian chant. It was what really recitar cantando. The world had great importance for him and to the music. He was a little bit, I would say, our Italian Debussy! There is a differentiation of the mode, but Schoenberg’s sprechgesang is the expression of our twentieth century, but is much nearer to a Monteverdi recitar cantando than any other nineteenth or eighteenth century music, which is ever adopting a different way. BD: It’s almost as if we’re coming full-circle! GS: Yes, coming back to the origin with another type of expression, because the twentieth century expresses itself differently than the sixteenth or seventeenth. GS: I do to an extent. Some of it... I have difficulties sometimes to understand things on first hearing, but I do appreciate it, yes. BD: Where is opera is going today? GS: [Laughs] I wish I knew! BD: Let’s talk about young singers. You’re working with some of them, so are they better prepared than they were thirty years ago? GS: Yes, most definitely. They start with more vocal techniques and they are musically better prepared. I must say that in the United States, they tend to be better musically and prepared than in Europe today. Especially in the Italian schools and conservatory, they seem to be stuck with just beautiful voices. Of course, there are plenty of beautiful voices but they don’t go far enough. BD: Are there too many beautiful voices? GS: There are never too many, because really we lose them half-way for lack of preparation. A misguided, beautiful voice is a lost voice, and that is what very often happens today in our society. BD: How can we avoid that? GS: It’s a bit of long story because the young singer that starts working his voice must have a voice. It is not like the seven year or eight or ten year old that puts his hands on a violin or piano or trumpet. He doesn’t immediately make the beauty of the sound. You feel that he has a certain amount of presence, but he has to work his technique to possess the instrument. The singer has to go backwards with the instrument to make it ready because if you don’t have a beautiful voice, you don’t start taking singing lessons. You have to start, and for many people it can get boring. People at sixteen, seventeen, eighteen, maybe they don’t know anything about music. They have to start from this solfège in order learn to read music from the alphabet. They have these beautiful instruments and they can already produce something, so they are tempted — or some teachers are tempted to push them too soon, too far because the instrument is beautiful and there’s nothing to do. You come to a point after three, four, five years of technique to know how to use the voice that you already have, but you need to learn to know why you already have it and what to do with it and not just let it go. It is a beautiful and wild horse, but it can gallop through the wilderness and stay in the wilderness if somebody doesn’t come. Sometimes it can even hurt. I know, because after three years I was studying, and at a certain moment I didn’t know anymore how to put this voice. There comes a point of crisis because the voice is just there, and then you have to overcome that. If you have studied well, then suddenly you get again the voice that you had when you started. But then you know what you do, and with years of experience you develop better, and it comes even better and better. But then it comes worse and worse and then you lose it. It takes intelligence from the teacher, intelligence from the pupil, meeting the right person that with abstractions and things can lead this voice. You cannot just say, “Lift your finger that way and then this sound comes out!” [Both laugh] No, it’s all imagination. It is all a design that comes from you. BD: It sounds like it takes a lot of patience! GS: Patience and work, and it’s a question of feelings. The vocal technique can be explained in half an hour — breathing, your resonance cavities and all that. It’s said very fast what you should to do, but then to do it, to be conscious of what you’re doing takes time. BD: Time to understand it? GS: To understand, and to learn that if you do this movement, if you breathe in that way, if you sustain, something like this or like that comes out. BD: Are there some singers who really should have the big career but for some reason don’t? GS: There is an amount of good fortune, chance, or whatever it is that comes into it, but you must be all ready — not only technically and musically, but ready to risk. Then, if you have the quality you must go somewhere. If somebody with a beautiful voice and a certain amount of technique doesn’t get there, there must be something in himself that’s not ready. You have to expose yourself to the risk and sometimes it is not always a success. It is a risk to go away from your family, to be alone a lot, to sacrifice something of your private life. There are many things that have to come, and you have to decide on that. It’s not only the glamor. BD: Do you enjoy all the travel? BD: You seem to be a wondering minstrel! GS: I do, yes. [Laughs] We all do that. Of course we are fatigued by it, especially when you start packing and unpacking, and coming to all the different places. When I read some of the novels, I have to laugh enormously when it comes to the character of an opera singer that arrives with an army of servants that do everything for her. I was lucky enough to sometimes have a body to help me. But believe me there’s been more of the time when I had to pack, unpack, come tired from a rehearsal and then grab the next train or plane, or drive at night to get from one place to the other all by myself. There was no other chance, or you get to the station and there is no porter. Now we have suitcases with wheels because even if you have all the money in the world, if there’s not a porter there, we used to come crying on your suitcase, and that’s it. BD: Is there too much reliance on the jet plane? GS: Yes, there is. There is a certain amount of that. That is also, again, something that you have to do intelligently enough so as not to accept too much. GS: It is difficult. It is difficult to say no to that because if I get there and I’m half dead, maybe I will not produce a hundred per cent of what I could be producing. BD: Now there’s a performance of Così tonight (Saturday), and there’s another one Monday. Is that too close together for the singers? GS: No, no. That is alright, just one day between. It couldn’t be every second day for ten days or something like that. But I’ve been for ten years in the Staatsoper in Vienna, and there were weeks where we had three or four performances in one week. Then the next week we had two, then a week with just one. BD: So it balances out? GS: It balances, doing them in the month sometime. Besides, the singers are here. Tonight they sing, tomorrow they go back to the hotel and they lie down and rest. They shouldn’t talk too much or go out. That is up to them, but the difficulties would appear if the Così would be here in Chicago tonight and Monday in Buenos Aires. Then it’s a different question. Then you have the travel and the climate and the food and everything. BD: In Buenos Aires there would be no big time change, but from here to Vienna there would be the tremendous time change. GS: From here to Vienna there’s a tremendous change, but it is something one has to deal with. Nobody is really forcing you to do it. You’re always master of yourself, and if you accept to do it, you must do it. BD: How much influence is the agent in those decisions? GS: That depends on the contract you have with your agent. If you accept to sell yourself to the agent and the agent can throw you around, that’s one thing. But nobody can come to you and say you must go there! No. The agent will come to you and say that they have asked you to go there, and it is up to you to say if you are going or not. Even if the agent or conductor pleads with you to go, you are still free to say no. BD: So the singer must be strong. GS: Yes, yes. It’s difficult to not go there because it’s probably a lot of money, and sometimes there is a new theater that you’ve never sung there before. Perhaps it is an opening of another work that can come back for next year, so sometimes that you have to accept for that reason. I have done it very seldom, as little as possible, but it has happened to me that there was a very tight schedule, but it was interesting. It was important to go there, so you do. But when that happens, you must get there, not to get too tired, and then do it. BD: Give it a little extra energy to keep you up? GS: Yes, and then immediately after that you must have your rest. That depends on how old you are and what your energies are. You must calculate what you can give. Everybody has a different demand of energy to give. BD: We seem to be in the age of stage director and the stage designer, where they’re taking over things. Is it sometimes too much? GS: Yes it is too much when the stage director or the stage designer does his job for his own merit, for himself. He wants to become very important, and he’s not so true to the work. It is easier to make a scandal where everybody says how awful, how terrible! But it’s terrible to put these persons on a level where everybody’s talking about them. They get on the front page if it’s not a success, but I must say very few they come with this in mind. GS: Yes, yes, but it is subsiding a little bit. After all, the theater directors and all the musicians have something to say. There are some artists who say that if that director is going to do the production, they are not going to sing there. BD: Would you ever accept a contract to direct Così in modern dress, or even set in today, 1980? GS: I don’t know if I would accept that. It’s not so much the 1980 dresses that would upset me or make me shiver. It is the music that goes with the words that doesn’t suit the emotions of today. BD: I remember reading about a Così performance a few years ago at one of the schools in the East, and instead of being Albanians, Ferrando and Guglielmo came back a hippies! GS: I don’t say somebody can’t do it. I just feel those are characters that belong probably to old times. Something which has really happened could probably happen today. Who knows? I don’t feel like I would do it. I’m not criticizing if somebody would like to do it like that. That’s his choice. 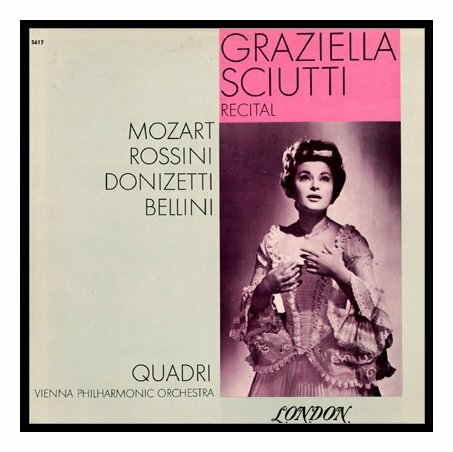 GS: Basically no, because I believe so much in the phrasing, especially in the Italian operas of Mozart. The marriage of Da Ponte and Mozart is so absolute, with the timing of the recitativo, the musical accentuation of the words, of the phrasing, which is very difficult to do in other languages. BD: You don’t feel, though, that if it’s in the language of the audience it gains so much more closeness? GS: This is why I said ‘basically’ no. I don’t approve, but I have been singing in translation myself. There are occasions when it comes to this as a first choice. For a certain public which is not so well prepared for a certain type of opera, it is better that they can follow the text in a better way than in a foreign language where they would be a little lost. I even lived a very special experience in Vienna. After some years of very successful Così fan Tutte in Italian in Vienna and especially a production in Salzburg conducted by Böhm with stage director Günther Rennert, those two people were so certain that if this opera had been done in German the public would have been more amused. They wanted not to do this in Salzburg, but to bring this production to Vienna in German. 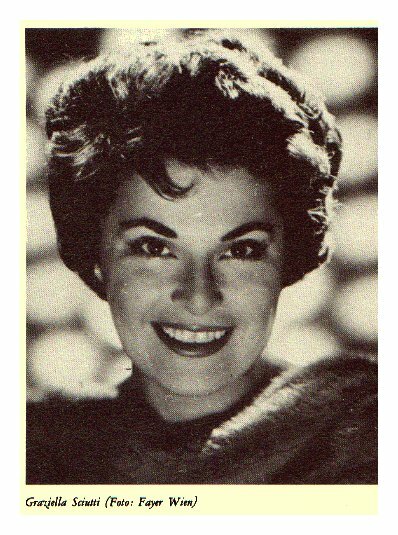 The only Italian singer of the production was me because there was Schwarzkopf, Christa Ludwig, Hermann Prey, and Karl Dönch. [See my Interview with Hermann Prey. She does not mention the tenor, but I assume it was Waldemar Kmentt.] So the problem was mine. But I speak German and so Böhm asked me if I wouldn’t mind to learn Despina in German, and I said I would if they gave me enough time. It was a bit of a problem to change after having done it so many years in Italian, but I worked at it and it was announced for the next season at the Vienna Staatsoper. Everyone was very much expecting this production, and we arrived and we did it. Strangely enough, my German colleagues were not so clear in their German enunciation as I was, which probably was because I had to study it very, very thoroughly. Critics started to say the only person they could understand was the German of Miss Sciutti! But apart from that, the public started to send letters asking why in German it loses so much of its charm? There were also complaints, asking if they thought the Viennese public is so ignorant, having had Così fan Tutte for so many years in Italian they could not follow perfectly well all the comic things of the Italian language, because Così fan Tutte is full of double-meanings! So after one year of this German production, we went back to the Italian! [Both laugh] Poor Böhm and Rennert were destroyed by the experiment that didn’t work! It caused a revolution in the public! Then of course I’ve done some operettas, like Fledermaus. In Vienna it was in German, then in Italy I’ve sung it in Italian, in Geneva I sang it in French, and in London I’ve been singing it in English. There is a lot of spoken dialogue, which would be absurd otherwise. I’ve also done some years ago a wonderful production of Orpheus in the Underworld in English for the Dallas Civic Opera. I’ve also done another one in Italian in Italy, so those are special things. Once I did the Barber of Seville in Paris in French, and it was quite funny because in Paris it was not the Rossini recitative, it was the spoken recitative of Beaumarchais! So I have done some of these things, but I prefer the original. That is something really quite, quite special. It is a perfection of the unity of the word and the music... of course, most of the time the music has been inspired by the phrase. Sometimes the composer has asked for certain changes in the words, and it’s very interesting to read the correspondence. BD: And, of course, some translations seem to work better than others. GS: Yes, yes! As a director I’ve produced The Marriage of Figaro in Toronto in English. That was interesting, and I made some changes in the translation. Now that I do a lot of recitals, I sing everything in the original language. If I do Schumann, it’s in German; if I do Debussy it is in French, etc. BD: When you’re singing your recital, do you expect that the public will have the text in front of them? GS: No. I don’t like them to look at the paper. I like them to look at me. I translate it before I sing it. BD: Oh, you speak the translation? GS: I speak the translation. Not a wordy translation word for word, but the meaning and certain words that are particularly characteristic of the piece. I find that is a great success. I’ve done that in London, in Paris, and in Italy. Of course in Paris I don’t translate Ravel or Debussy, I translate the Schumann and the Italian or whatever it is. In Italy it is the same thing, and I’ve really had great appreciation from the public and from the critics. I prefer to do it in that way, more than have them read and be distracted by reading. To follow the context immediately after the explanation of the mood of the piece that is coming works! BD: So you are continuing to sing as well as direct? BD: How do you balance the singing and the directing? GS: Let’s say my months are like containers. In a container I have two or three months of directing, and in another container I have two months of singing. I don’t mix it because directing is very, very tiring. BD: Would you ever direct a Così where you would sing Despina? GS: No, I would never do that because it would take away something from one or the other, for the performer or from the director. I wouldn’t do that. GS: They choose to do that. That’s their choice. I wouldn’t feel like doing it. BD: Are you getting more and more into the directing now? GS: Yes. Somehow the work is coming to me very much, and I enjoy it. But of course I also foresee one day that I will stop singing completely, and it’s wonderful to have already a very well advanced career as a director. BD: Is it surprising to you that opera houses come to you and say they’d like you to direct this or that? GS: It’s still surprises me, yes. I was surprised when I was asked the first time because I really didn’t have any idea to go into directing. When I was singing in opera, I always liked to have something to say, although I didn’t impose myself to directors. But I was creating ideas in my head already. Some of those directors said that one day I was going to direct because I see the opera from a director point of view, not from a singer point of view. I always laughed at that thought! Then a director, John Copley, asked me to go and help out in L’Elisir d’amore at Covent Garden. He told me it would be a co-production, and he would do all the technical things. He wanted me to talk with the artists about the parts of the roles, and guide the chorus. I found myself very at ease. Then came the occasion where Glyndebourne asked me to sing La voix humaine, which was very difficult as it’s a one-woman show. So when they asked me who I wanted to direct it, I thought why can’t I direct myself? They were enthusiastic about that wonderful idea, and I liked it very much. BD: [Mildly triumphantly] So you have directed a production you have been singing in! GS: Yes, but I was the only one to sing! [Both laugh] I didn’t have to direct others, you see, although I had to do all the other things, too. My relationship with the designer was very close because I wanted a certain amount of things on stage. I decided what the lights would do, and all that I did myself. BD: At least they knew you wouldn’t walk out on the director! BD: Have you directed operas in which you had not sung the parts earlier in your career? GS: Until now, no. Well, I directed some baroque works in Italy during a festival of recitar cantando. It was in a beautiful villa outside Bologna where I had done some operas of Mazzocchi and Monteverdi and Caccini, but I didn’t sing myself. BD: When you direct an opera in which you have sung, do you bring ideas that were given to you by other directors? GS: Of course, I’m very much influenced. There is an amount of things I remember, but I also have new ideas. Sometimes I was not very satisfied with what the director was asking us to do, which I felt it was not extremely right. Now I do the things that they didn’t do! But I was very fortunate to have extraordinary directors in my career. I was with Visconti, Strehler, Rennert, Oscar Fritz Schuh, Carl Ebert, Herbert Graf, Ponnelle, then also some of the younger generation like Copley or Mansouri. [See my Interview with Lotfi Mansouri.] All these particular encounters do mean a lot. BD: Do you find it is extra work directing operas you haven’t sung because you have to learn a whole new score and libretto? GS: Yes, the work is in learning the score, but it is not a difficulty. As a matter of fact, I almost would enjoy more the challenge of directing an opera where I’ve nothing to do before. I would feel somehow less influenced. BD: Do you set any pre-conditions when you come into directing — you must have this or you must have that? GS: Yes, but I wouldn’t put it as really dictatorial things. There’s always a certain understanding — I would like these and I would prefer that, and so on. You have certain wishes that you put on the table, and some are met. Some I understand if they can’t be met. BD: Do you request a certain number of rehearsals? GS: The number of rehearsals is important, of course. They say we could have this amount of time — two or three weeks. I wouldn’t accept if the time would be too short. That is not possible because then I wouldn’t be able to do the work the way I want. BD: [With a gentle nudge] You don’t want to stage Falstaff in two days? GS: No! [Both laugh] I know that it happened, but that I certainly wouldn’t accept. But we come to the amount of time that is agreeable with me. Until now I never had a difficulty about that. BD: [With mock horror] Never??? [She laughs] What if you get six months to work on a single production? GS: There can be a time where you feel that it is too much, but then if you let it rest one or two days, when you go back to it then you feel stronger, and you can continue to build up from that. Let me tell you a related story. For many years my favorite role was Susanna in The Marriage of Figaro, and I was lucky enough to have a great success from the beginning. I sang it in Aix-en-Provence, and there was a terrible critic for Le Figaro. It was signed as ‘Clarendon’, and everyone trembled about him. [Bernard Gavoty (1908-1981), organist, musicologist and music critic for Le Figaro; signed his articles under the pseudonym ‘Clarendon’.] Anyway, he alters the title so it was not The Marriage of Figaro but it was The Marriage of Susanna! [Both laugh] So I started really on the right foot. But although I knew that it was a good performance, every time I rehearsed it I found my role developing and getting even further and further. I’ve now stopped to sing that role, but if I would have the chance to sing it again, I am sure in the next performance I would still have something more to say. BD: There is always something more to learn! BD: You mentioned this critic that everyone was terrified of, so what’s the role of the critic? GS: A critic is somebody that has a certain amount of importance. It depends also who the critic is. He’s in a position in the musical world who is not just a person that arrives in the paper. Anybody can write anything in the paper, so there are people who come to be critics in the paper who know very little. Of course you realize this from the type of criticism that they give you. Even when it’s a good one, my God, he didn’t get the message! [Both laugh] It’s disturbing when it’s not a good critic, not so much because you have not been recognized for what you have been doing, but because a lot of people that are reading it haven’t seen the show, and they might be influenced by a bad critic, which probably was not right to be bad. A good critic, of course, gives me a lot of pleasure! As long as it has not been a continuous repetition of bad performances, one bad review never really destroyed a good career and a good artist. Any artist can have a moment of bad voice, or, as a director, a moment of bad ideas. It is like in any sport. In the whole of his matches you can judge him, but not on one evening, or one goal. BD: Is being a singer like being an athlete? GS: Somehow, yes. We have to do with our muscles and our body. BD: Do you feel you’re in training all the time? GS: Yes, yes. It’s muscular training. Remember, the vocal cords are two muscles! But that is not the most important thing. It is with the breathing support which is important. Also, it is your good health. It is a discipline in your way of life, like any good sportsman. BD: Have you ever had any really weird things happen while you were on stage? GS: Yes, there are a lot of things that are happening. They are, and when one sees them after, one can laugh. They are terrible when they happen... like losing shoes on stage or being dressed in the wrong costume too soon or having to sing something as a dialogue with somebody that’s never appeared yet on stage because he’s forgotten to come on stage! Then you find yourself all alone and you have to do both parts. BD: Has that happened to you? GS: It’s happened to me, yes! You do a lot with a big long recitativo, and thank God you know the part of the other person! The conductor is looking in desperation, and back-stage everybody looking for this artist. In my case, my colleague was in the toilet! [Much laughter] A difficult place to find him! BD: So did you ask and answer your own questions? GS: Yes, I had to answer my questions until he realized that he had to be on stage, and he dashed there! BD: Was this in a place the audience understood the language? GS: No, but of course some people knew the opera. It was not so much a question of understanding. They thought maybe it was a new interpretation of the director, you see. [More gales of laughter] There’s always a scapegoat, the actor in that case! BD: Did you ever get blamed for things that were the director’s fault? GS: Yes, yes, yes, but it more often happened to the contrary, that we have done something that the director didn’t want, and it was blamed on the director! BD: I wonder if you’ll get any of that back, now that you’re directing? BD: Thank you so very, very much for being a singer, and thank you for now bringing all that experience to directing. GS: Yes, thank you. I hope that I can do that. I finished the master classes, and that’s what I told my pupil in sort of in a farewell speech, that it is something. I had just received yesterday a letter from my teacher. She is a very old lady who lives near Rome, and we still write. She’s still very much alert with her mind, and I still get a lot of good advice from her. She’s so happy to see that her favorite pupil has done so much in the career. Now I give it further to others, and that’s what I’m trying to tell these young people as they start. I tell them not to forget it, that it will happen in twenty or thirty years. It is a long time. Don’t let this flame be extinguished. BD: Does it make you feel good to know that you’re passing this along? GS: Yes, very much, yes. You have to spread it around very much because there are few that then get the message. It’s not to everybody that one can say this. BD: Thank you for coming to Chicago. I hope that we see you again! GS: Yes, there are rumors that I’m coming back! We are working on my return to Chicago! BD: To direct or to sing, or do both? GS: No, to direct. I’m not going to sing in opera anymore. BD: But you will keep up the recitals? BD: We look forward to you coming back and directing whatever you like in the next few years in Chicago. 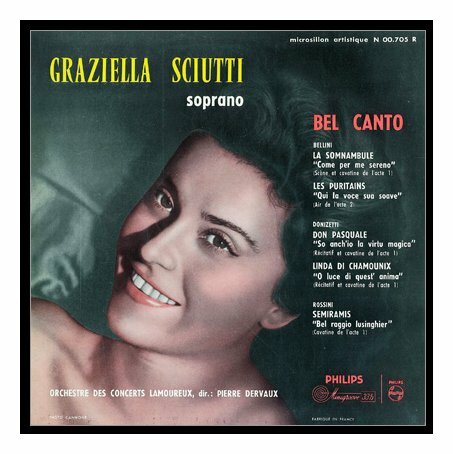 Graziella Sciutti, an Italian soprano and opera director whose purity of sound and deft characterizations won her admiration in Mozart, Puccini and Verdi roles, died on Monday in Geneva. She was 73 and lived in Geneva and London. The cause of death was cancer, according to The Associated Press. 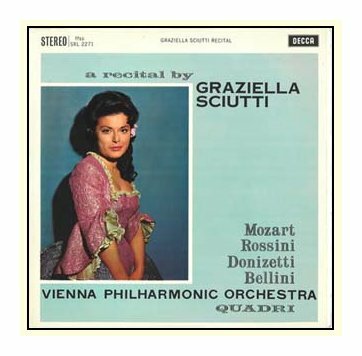 Ms. Sciutti made her Covent Garden debut in 1956, and her American debut, at the San Francisco Opera, in 1961. 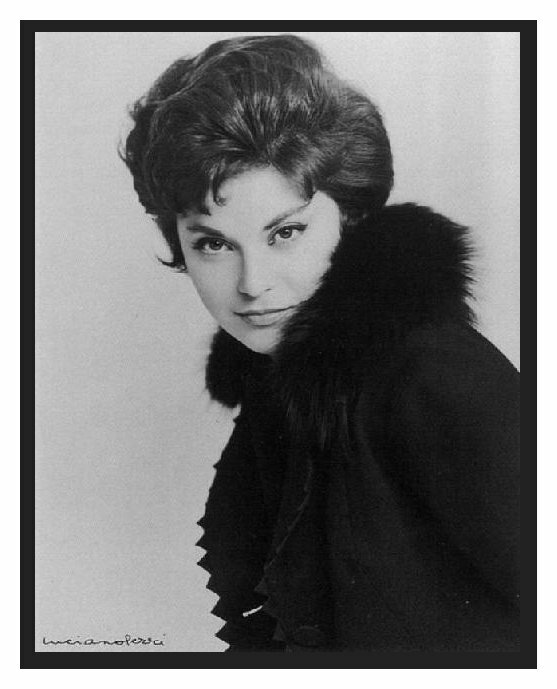 She was also a member of the Vienna State Opera roster for several years, where her most successful roles were in the Mozart operas and as Nanetta in a Luchino Visconti production of Verdi's ''Falstaff.'' And she sang at the Salzburg Festival for nearly 20 years. 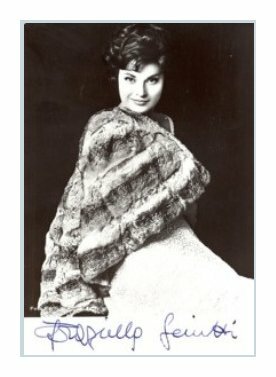 In 1977 Ms. Sciutti sang in and directed a production of Poulenc's ''Voix Humaine'' at Glyndebourne, preparing her way to give up the stage and become a director. She staged productions of ''Le Nozze di Figaro'' and Donizetti's ''Elisir d'Amore'' at the Canadian Opera, and in 1983 she made her New York directing debut with a highly praised staging of Puccini's ''Bohème'' at the Juilliard School. In 1984 she revised Colin Graham's production of ''Così Fan Tutte'' at the Metropolitan Opera. Her 1995 staging of ''La Bohème'' at the New York City Opera won an Emmy Award after it was broadcast as part of the ''Live From Lincoln Center'' series in 1997. Ms. Sciutti taught at the Royal College of Music in London and gave master classes at the Lyric Center of Chicago, at the Juilliard School and as part of the Merola Opera Program at the San Francisco Opera. She is survived by a daughter, Susanna. This conversation was recorded in the lower-level restaurant area of her hotel in Chicago on October 30, 1982. Portions were broadcast on WNIB (along with recordings) in 1985, 1992 and 1997. A copy of the unedited audio was placed in the Archive of Contemporary Music at Northwestern Univeristy. This transcription was made in 2014, and posted on this website at that time. My thanks to British soprano Una Barry for her help in preparing this website presentation.